We use crowns to restore teeth with extensive decay, fractures or wear. Crowns are made out of various materials and cover the whole tooth. 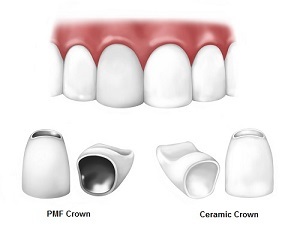 A pmf crown consists of a metal structure covering the tooth, with porcelain fused onto it. The metal can cause a black line that is visible on the tooth, as well as darkening of the gums. At CSD, the indication for pmf crowns are very small, and we use metal free options wherever possible. The E-Max dental crown is considered to be the best inclusion in dental crown technology. It is an all-ceramic crown which provides the best appearance by complimenting with the natural teeth. It has an appealing translucent colour and is highly durable with extra strength, so it lasts longer. E-max crowns are generally constructed by 4 techniques: Pressed, milled Yttrium Zirconia, pressed to Zirconia, and a milled aesthetic glass. Zirconia is a strong, biocompatible material, which is also used in medical applications like artificial joints. It’s all ceramic and known for improving the appearance of teeth that have previously been stained for an extended period of time. Bridges are inserted when one or more natural teeth are missing. These are artificial teeth which are joined to the existing natural teeth to mimic the appearance and function of a full set of natural teeth.